We've had a LOT happen in the last 2 weeks, so we'll try to fit it all in. Our apartment is newly-refurbished and our landlady has done a fantastic job purchasing items for us. Since we've been here, we have acquired two living room chairs, a desk, a bookshelf, a living room rug, and a ton of appliances and accessories for cooking and everything. We're really pleased with our Latvia home, especially that it's comfortable, safe, and close to the JVLMA. Leah and Sarah have been busy decorating their bedroom with artwork! We had some visitors on January 23-24...Northwest graduate Ben Mendenhall and his friend Meghan Benegar flew to Riga from London, where they have served as interns (he's with Deutsche Bank Group) since August, 2009 and are working on graduate certificates in International Business Practice at St. Mary's University College. Murphy's Law helped them to pick the coldest weekend of the year to visit our fair city, but we had a fantastic time hanging-out. Whilst showing Meghan and Ben the area around the Freedom Monument, we found the "Lock-Bridge" we had been reading about. In an adjoining park, married couples place padlocks onto this bridge and throw the key in the water as a symbol of their devotion...pretty sweet! The two above pictures were stolen from Ben's facebook site and the images got a bit fuzzy...sorry. 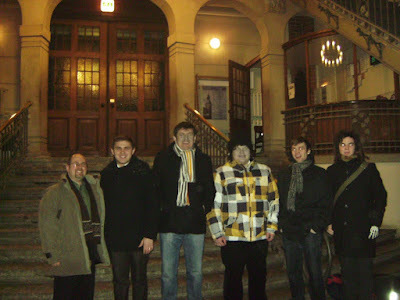 School officially began at the Jazeps Vitols Latvian Academy of Music on Monday, January 25, 2010. Bill's started teaching and played flugelhorn with the Latvian Brass Band for their weekly rehearsal. On Wednesday, he met with the extraordinarily helpful folks at the U.S. Embassy here in Riga. Since we're here longer than 90 days, Fulbrighters must apply for a Temporary Residence permit, a procedure that apparently takes quite a bit of paper-pushing. Luckily (for us, at least), the Embassy staff do most of the actual work making things happen! Paperwork is NOT Viljam's strong point, on ANY continent. Friday, January 29, was quite eventful for the whole family. Bill was invited to participate in a Fulbright M.O.U. signing ceremony at the Latvian Ministry of Education and Science. Here is their web-site: U.S. Embassy in Riga, Latvia. It was fun, but he learned that people walking are supposed to obey traffic signals here. On the way home, Viljams Ricardson received a written warning from a Latvian police officer...we will now wait for the signal to turn green before crossing the street! BTW, some of us seriously considered scanning the official citation to post on this blog, but cooler heads prevailed! Friday afternoon Bill helped adjudicate the 15th annual Youth Music Competition for young Latvian musicians. He served on the jury with adjudicators from Latvia, Lithuania, and Russia. Anyway, Bill's checking to see whether he can get some video posted soon. We shall see. Until then, Uz redzēšanos!